Do you want to bring current events to your classroom AND make them relevant? This free print-and-go question worksheet pairs nicely with any article of the week. It requires students to think critically about an event in the news and examine how it is relevant in their lives, communities and the world. This question sheet is designed for students in grades 6-12 and can be used as a stand-alone activity or as part of a larger assignment. It fits seamlessly into an English Language Arts or Social Studies classroom. This FREE download will be part of a larger unit that includes all of the key English Language Arts Common Core Standards — reading, writing, speaking, listening and language. The larger unit contains close reading and annotation skills, writing a response, practicing effective presentations and using technology to enhance presentations. These products (with full instructions and rubrics) will be uploaded to my store soon. 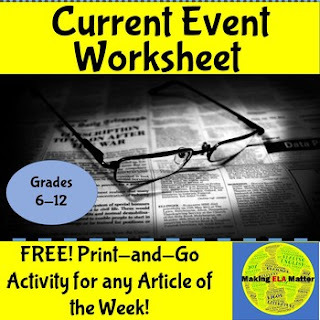 My current event project overview with teacher instructions, student handout, and the detailed rubric is available now by clicking HERE. If you are interested in learning more about how to incorporate vital ELA skills by using current events in YOUR classroom, follow my store to get updates on these products.